Click here or on the “Wedding” tab above to see the all photos of this tablescape! Yes, I know I said I have retired! But when a friend asks, you answer…with a gracious – if not cautious – yes!!! I know autumn has settled upon us, but pictures from this late summer engagement party could not be ignored. I had such a wonderful time putting this together with a surprisingly almost total “hands off” approach from both families. In the end, they were pleased and I was relieved. No, I won’t be doing the wedding. I really have sworn off that part! You may see, however, a shower tablescape or two next spring as they near their June wedding date. 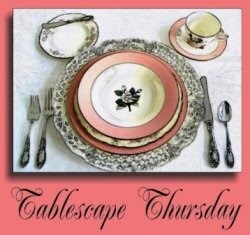 Tablescapes at Table Twenty-One is proud and pleased to participate once again in Tablescape Thursdays hosted by Susan at Between Naps on the Porch. You are welcome to peek in on the talents of lots of other tablescape enthusiasts! Those flower centerpieces are amazing! This is a beautiful table. I clicked to the wedding tab to really enjoy pictures! You are so gifted. OOh I love this whole tablescape! The colors..soft and pretty and the centerpieces…great ideas. Please come and link up to Centerpiece Wednesday. Oh that is just beautiful! 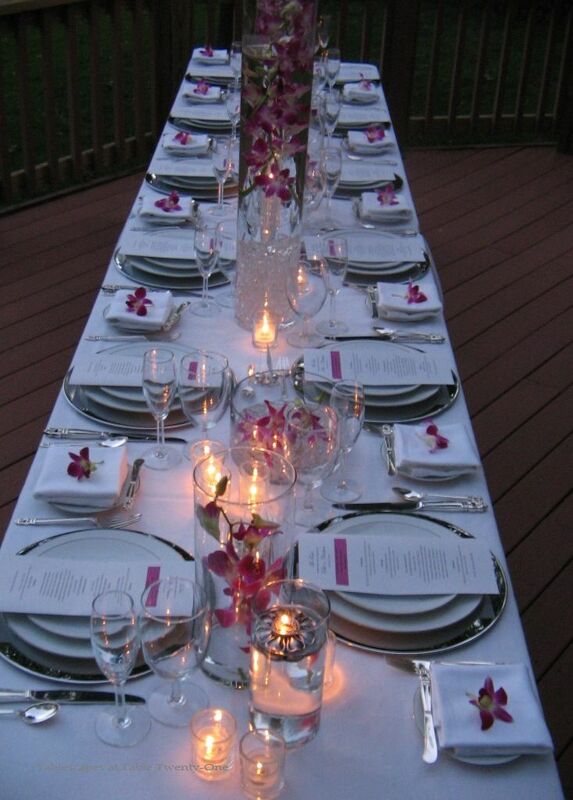 The flowers look amazing, the table is so elegant! FABULOUS!!! Please see my comment on the post you’ve linked us to. How gorgeous and elegant! The orchids are swoon-worthy! I love the menu with the “history” bits! Thank you for commenting on my table this week so I could find your amazing blog. I’ll be back to browse soon! My style & type of motives. Love the simple ambiance but so elegantly sets. Your table is just beautiful, I love the simplicity and lack of clutter that you imparted. The table looks full but not too full. The candles are just the right touch to set it off. I’m sure both families were over the moon with your creation. I love the table. Wow. the orchids certainly make it special. This is beautiful! It looks like the perfect table for an engagement party and the gathering of families about to be joined together soon.